This is the first in a series of posts by MMWD’s interns, summer helpers, and watershed aides about their experiences at the district. As a lifelong Marin resident, growing up in close proximity to the MMWD watershed has always provided me with ample access to abundant habitat away from freeways, cars, and traffic. I learned to mountain bike at a very early age. I’ve hiked miles upon miles of access roads surrounding just about every community and township in the central Marin areas. Throughout all of this time, I had never considered MMWD as a potential workplace until seeing a job posting for a summer intern. Being here now has brought me back to doing the work I love after earning my Associates degree at College of Marin last May. As an Information Technology intern, I’m assisting anyone at the district using computers (meaning everyone at the district). I came here in June, a few months after voluntary water-use reductions were requested by our Governor Jerry Brown and MMWD’s Board of Directors. With the education provided by our knowledgeable Water Conservation Department here at the district, I’ve learned that with planning and a little modification of my daily routine, using 25% less water throughout my day really isn’t too difficult and makes me feel like I’m making an important difference. I’m not a homeowner (yet). But, if I were, I would absolutely take advantage of the education and rebates the district is offering to residents who want to use less water. Even in the lobby of the district offices here, I’ve seen free supplies for testing for toilet leaks, changing showerheads, and learning better water practices, as well as 20% off coupons to Fairfax Lumber & Hardware for outdoor irrigation supplies. With all of the resources offered, it seems to me we could go above and beyond the 25% voluntary reduction requested by the board, which benefits not only your household, but all of Marin. MMWD is partnering with local retailers to help you give your garden a water-efficient makeover for less. For a limited time, participating businesses are generously offering coupons for a variety of water-conserving products for your landscape. You’ll find discounts on smart irrigation controllers (which also may be eligible for a rebate from MMWD), mulch, drought-tolerant plants, drip irrigation supplies, and more. Each retailer has a different discount, so visit our website to browse the offers and print the coupons that best meet your needs. Or, drop by our lobby at 220 Nellen Avenue in Corte Madera to pick up some coupons and other water-saving information and gadgets. Thank you to Fairfax Lumber & Hardware, Horizon, Marin Landscape Materials, Sonoma Compost, and The Urban Farmer Store for helping MMWD customers save water and money! Misplaced “Save Green, Save Blue” Coupon Results in Six More Weeks of Winter! According to folklore, if it is cloudy when a groundhog emerges from its burrow on Groundhog Day (February 2—this Saturday! ), then spring will come early; if it is sunny and the groundhog sees its shadow, it will retreat back into its burrow, signaling that winter weather will continue for six more weeks. In many areas of the U.S., early morning celebrations are held where people gather to watch the groundhog emerge from its burrow. The most famous of these events is in Punxsutawney, Pennsylvania (setting of the 1993 movie Groundhog Day), where “Punxsutawney Phil” is the resident rodent prognosticator. However, many areas have jumped on the furry bandwagon and have adopted their own marmot mascot—Dunkirk Dave, Susquehanna Sherman and Wiarton Willie to name just a few. And for those towns where alliteration just isn’t their thing, we have the likes of Gus, Uni, Spanish Joe and, of course, Jimmy the Groundhog. Few people know that our local groundhog, Marin Mortimer, is the star of his own annual festival and proudly emerges from his burrow every February 2 under the watchful gaze of curious onlookers, eager for news of what weather the next six weeks will bring. His last appearance was, unfortunately, not his proudest moment. For just after Mortimer fully emerged from his burrow, he realized he’d left his “Save Your Green, Save Our Blue” coupons on the kitchen table, and hastily retreated into his burrow to retrieve them, inadvertently signaling to the collected crowd the advent of six more weeks of winter. By the time he’d re-emerged from his cozy den, coupons in hand (rather, in paw), the crowd had disbanded, leaving Mortimer alone to rejoice at his lack of shadow and the imminent arrival of spring. Moral of the story: Don’t forget to grab your coupons before leaving the house. Visit MMWD’s “Save Your Green, Save Our Blue” coupon page to get discount coupons from local retailers and plumbers on leak repair, high-efficiency toilets, smart irrigation controllers, rainwater harvesting tanks, mulch, native plants and more. On a more somber note, we wish to extend our sympathy to our favorite retired gardener and blogger, Charlene Burgi, on the recent passing of her mother. Our thoughts are with Charlene and her family. We look forward to hearing from Charlene when she returns. I am notorious for saving almost everything. Being an adult child of a mother that lived through a depression, I learned my lessons well. My middle name should have been Frugal. Excitement for me is finding ways to make a dollar stretch. Water conservation falls easily into my way of thinking. Cardboard or Compost Queen are names I carry with pride. Why pay for tasteless hothouse tomatoes when the garden provides mouth-watering heirlooms? The savings are huge! 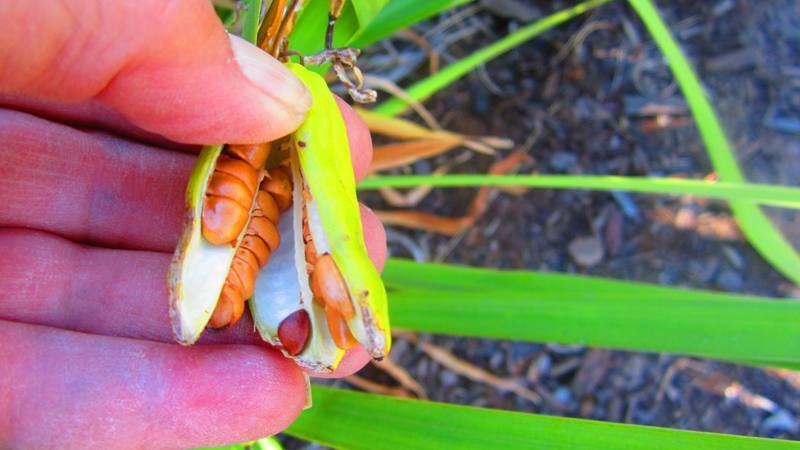 It comes as no surprise that seed collecting fits naturally with my repurposing and dollar-saving ways. Seed collecting can be an adventure. Knowing what to do with them after is another journey into the unknown. Each type of plant potentially needs a different method of treatment. 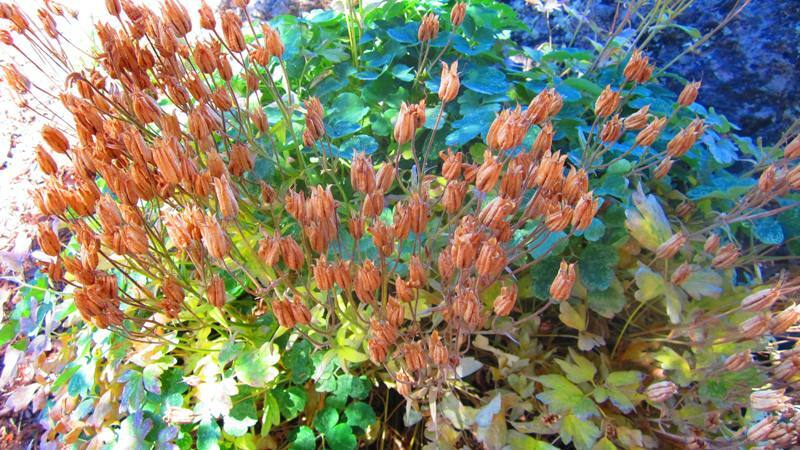 Some seeds, like columbine, require cold stratification—meaning the seeds must be kept in the refrigerator for a minimum of six weeks before planting. Other seeds such as morning glory germinate better if you scrape the seeds over a file to break into the thick hull. Still other seeds need intense heat to break through the seed hull and require overnight soaking in hot water. And those expensive peonies require double germination before even seeing a sprout! To list the methods of germination for each plant would require that I publish a book. However, there are great writings already out there for your reading pleasure. One general rule of thumb I can pass along for germination is that most seeds need constant heat and moisture once they are planted up. Typically the seeds must be planted at a depth of 2-3 times the seed diameter. Use horticultural sand or vermiculite to cover for easy sprouting. Enjoy experimenting with what you have collected! I just learned another exciting way to save water and money, both indoors and out. MMWD has re-launched its popular “Save Your Green, Save Our Blue” program in partnership with fifteen local retailers and plumbers, who are offering huge savings with coupons from their businesses. Is there a home or garden task you are putting off or about to embark on? See if any of these coupons can help make your dollar stretch. One last tidbit I wanted to share with you: As I walked around the garden viewing the potential seed heads, I noticed the volume was greatly dimmed compared to the usual droning of insects. The hummingbird feeder remained full, yet no hummers have been in sight for over a week. These indicators tell me dormancy and migrations are here. A friend shared a YouTube link that captures the moments I cherish in the garden. As the winter draws nearer, I can recall the joy found with these pollinators. The filmmaker provides a gift for the forthcoming bleak winter days. Instead of a to-do list this week, please sit back with the beverage of your choice, relax and enjoy this short clip. You might also want to save it for those long rainy days ahead. In 1999, the Secretary of Agriculture proclaimed October as National Popcorn Poppin’ Month, due to the popcorn harvest that takes place in the Midwest every fall. Now, you probably didn’t know October was Popcorn Poppin’ Month, and you probably had no idea that the Secretary of Agriculture had the authority to proclaim any month to be any thing. Well, I guess you learn something new every day. Here’s another new thing you should know: MMWD is partnering with 15 local businesses who are generously offering special discount coupons for a variety of water-saving materials, products and plants that will help reduce your water use both inside and outside your home. You’ll find discounts on mulch, California native plants, irrigation supplies, high-efficiency toilets and showerheads, and more. Click here, check it out, print these valuable coupons (and remember to note the expiration dates). So, next time you’re sitting there just waiting for that corn to finish poppin’, use the time to print yourself out some coupons and make plans to start saving yourself some green and saving our blue! MMWD customers can receive free, water-wise advice for their home gardens by scheduling a “Bay-Friendly Garden Walk.” The garden walks are offered through a partnership between Marin Master Gardeners and MMWD. Receive a personalized landscape assessment and learn about sustainable Bay-Friendly gardening practices such as water-efficient irrigation, healthy soil management and good plant choices to help conserve Marin’s precious water resources. The onsite visits usually take about one hour. To schedule, contact Marin Master Gardeners at (415) 473-4204. MMWD has teamed up with The Urban Farmer Store in Mill Valley and the U.S. Environmental Protection Agency’s WaterSense program to make it easier for MMWD customers to purchase water-efficient smart irrigation controllers. For a limited time, The Urban Farmer Store is generously offering a 20-percent discount coupon for any WaterSense labeled smart irrigation controller in stock. Just print your coupon and take it with you when you visit the store. The U.S. EPA’s WaterSense program helps consumers make smart water choices by offering a simple way to identify water-efficient products and services. This is the first summer that WaterSense labeled smart irrigation controllers are available. You can also “look for the label” on toilets, showerheads, bathroom faucets and other products and services. Thursday, September 13: Join local author and MMWD Director Jack Gibson for a presentation and book-signing for the new photo history book, Mount Tamalpais and the Marin Municipal Water District, 6:30-8:00 p.m. at the Marin History Museum. Saturday, September 22: “Walk into History” with the Marin Conservation League and learn how Mt. Tamalpais was conserved as public land on this 4½ mile hike. Jack Gibson will be a special guest. Meet 9:30 a.m. at Rock Spring Parking Lot. If he were around today, I’d tell him that, eventually, tomorrow becomes today, today becomes yesterday, and before you know it you’re turning the calendar from July to August and you’ve missed Smart Irrigation Month! But, even if you have a tendency to procrastinate, you still have the opportunity to celebrate this annual month-long event which focuses on increasing awareness of water-use efficiency. And what better way to celebrate than by getting 20 percent off a WaterSense labeled smart irrigation controller from The Urban Farmer Store in Mill Valley! Studies show that a smart irrigation controller can reduce irrigation water use by 25 percent on average, which means you can save water, reduce your water bill and have happier plants. You will probably want to have a professional install and fine tune your controller, but once it’s up and running it’s simple and convenient. And as my grandfather would say, “You can lead a horse to water but you can’t get him to set the irrigation controller, what with his poor dexterity on account of his lack of fingers and such.” So forget about any of your equine acquaintances, quit your procrastinating, print out a 20-percent-off coupon from our website, and visit The Urban Farmer Store in Mill Valley today, because it’s never too late to celebrate Smart Irrigation Month.